I honestly have more paper than any one person should ever have. It's my thing...my favorite thing. In fact, I often try my hardest not to walk by paper when I'm the craft store. If I'm in a scrapbooking store, I intentionally try to focus on anything BUT paper, because if I see pretty paper, I'm done for. You may be wondering, "You're complaining, because....?" Well, I'm not really complaining, but my (pre-CTMH) collection of paper doesn't leave a lot of room for my CTMH paper. And that's a problem, because what I have found since joining Close To My Heart, is that I rarely use paper that I buy elsewhere. Not intentionally. I'm not one of those people who say, "I won't use anything but brand X." No, no, no. I'm an equal opportunity paper buyer and if there was more time to scrap, an equal opportunity user (well, truthfully...probably not "equal"). The Close To My Heart cardstock that I own is stored in ten paper trays...a mere fraction of the shelves/drawers in which my other papers are stored. 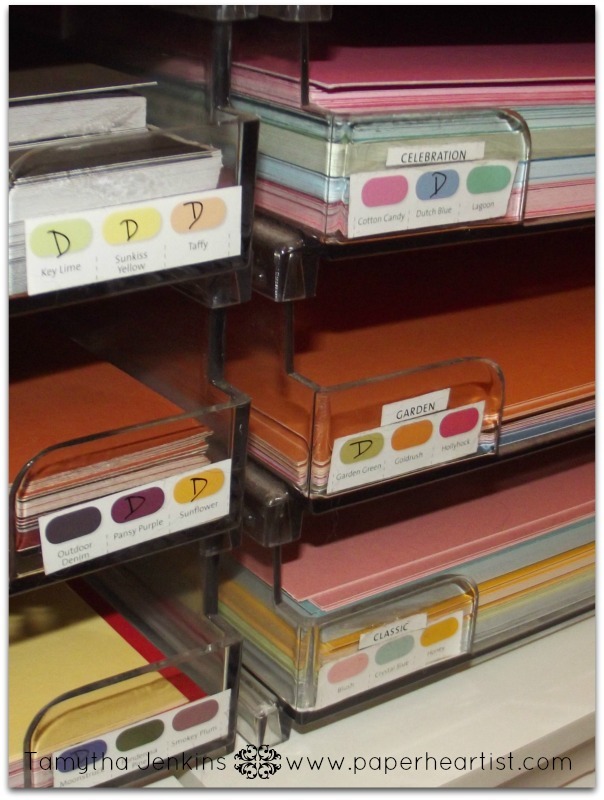 Anyway, I've seen various ways that other CTMH consultants & customers store their cardstock and many have a space for each color. 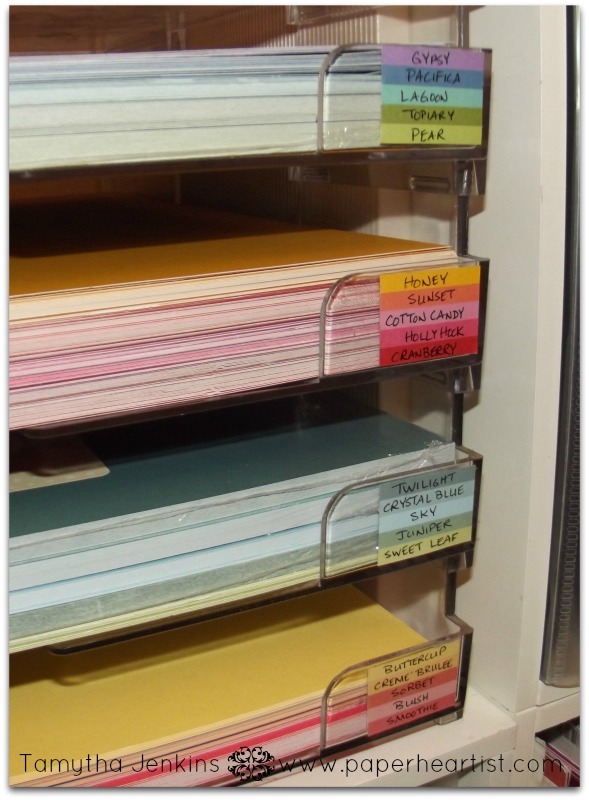 Well, since I only have the trays to store my CTMH paper, I have to have several colors of cardstock within one tray. So how do I know which paper is where? Well, this is what I did a couple of years ago...soon after joining CTMH. I cut out the color samples from the Idea Book, putting three on one side of the tray and the other three of the color family on the opposite side of the tray. There used to be 60 colors, so I had 6 colors in each tray. Once we learned of which colors were being discontinued this past summer, I wrote a D on the color...so I couldn't forget as easily. Due to the discontinuing of some colors, and the addition of others, I was in need of reorganizing my CTMH cardstock. I finally got around to it this past weekend, which wasn't as easy as I thought. The adhesive from my mini-xyron is some strong stuff! I had to use quite a bit of elbow grease along with some Un-du and my Pampered Chef scraper to get it removed. What fun! Anyway, the color samples in the current Idea Book are now in columns with the names to the right. At first, I wondered how I was ever going to get them to fit. Then it dawned on me to write the names write on the color. (I have a brilliant moment every couple of years or so.) And here's what they look like now. Now because there are only 40 colors (plus white daisy and colonial white), I have 5 colors in each of the 8 trays and all of my discontinued colors in one tray and my colonial white and white daisy in the last tray. A girl after my own heart...I love pretty paper too! I like your CS organization idea. This looks great! but how do you organize the CTMH B&T papers? do you take the packs apart and put all the solids in with the solid colors.. or do you keep each paper packet together? I am new so don't have that many packets yet, but I can't bear to take them apart so leave each pack in it "baggie"... but I really don't know what solid colors I have altogether. And do you only work within the packs or do you take solids out of the packs and use on another project? I do LOVE the CTMH papers, but also love others as love the variety. How do you incorporate those "other" papers in with your CTMH projects? I usually work with the WOTG kits. When I'm done with my projects, I do pull out my cardstock. I put full sheets with the rest of my cardstock and smaller pieces in a ziplock that I keep scraps in (though I'd like to find a better way to organize my scraps). I keep all my pattern papers together in their ziplock bag and store in a large tote from cropper hopper that I've had forever. It holds file folders for 12x12 paper. Since my time is limited (during the school year), most of my projects are for workshops, so I do stick to the papers in the paper pack. However, whenever I'm working on a personal project, I will go to my scraps (for smaller cardstock pieces) and the baggies for pattern paper pieces. If I need full sheets of cardstock, I pull them from my paper trays. Does that make sense? Again, because right now my time is limited, when I do have time to work on projects, it's to promote my business. When I have more time to work on personal, non-business, projects, I use whatever I want and whatever best works for my pictures and/or goals. I love your organization. I recently bought a whole stack of paper from someone and I am trying to organize by color. Some colors ar so similar. Where did you get your paper trays from?